SECURE: The kit's locking bit holder attachment locks hex bits for security during high-torque driving or drilling. Our testing this time was for the purpose of finding the best wood router. As with any tool, there are hundreds of products available. That doesn’t mean that hundreds are worth their money. We all know that products that are sorely lacking unfortunately make it to the market all the time. Because of this, we go out and test each one to find the ones that really stand out. For this project, we tested all of our hopeful routers for their motor power, their durability, ease of use, look and design. We wanted the absolute best of the best. After much testing, arguing and debating, here is our final list of the top three routers and our one budget buy! We chose the Bosch 1617EVSPK 12 Amp 2 ¼-Horsepower Plunge and Fixed Base Variable Speed router kit as our number one gold product. It is for quite a few good reasons we chose this machine. It is easy to use and still powerful, accurate and a great addition to anyone’s workshop. When it comes to power, the Bosch 1617EVSPK offers a lot. You aren’t going to find any jobs you can’t tackle with 2.25hp and 12amps of power. The speed range on the machine is great too—at 8,000RPM to 25,000RPM. You can easily switch between the two RPM-rates to adjust for the type of wood and/or job you are working on. We also liked the technology of this Bosch model because it is made with Constant Response Circuitry. That means that its speed is maintained throughout your entire cut, which in the end will give you more accurate and clean jobs. The fact that this machine can not only complete the router’s basic job, but it also can improve on the results is what put it at the top of our list. It definitely is a welcomed addition to any job that needs a router to complete it. On top of the power, the Bosch also has a great package design to it. It comes with both fixed and plunge capabilities. What we liked about the two is the transition. It’s easier than ever to remove the motor from one and affix it to the other via quick-clamps. It literally takes a few seconds to jump back and forth from each. This makes all jobs easier and eliminates the need to play around with a wide variety of clumsy clamps or adjusting mechanisms. This model has a precision centering feature to it that allows the bit to stay centered with the sub-base or with a template if you use one. It worked well with the jigs, dovetail fixtures and templates we tested it with. Next we looked at the comfort features. If you’re doing a big job and need lots of router-work, you want your hands to be as comfortable as possible. This is why we purposely focused on assessing each of our products for how well they felt. We tried to imagine hours and hours of use. The Bosch’s fixed base has polished wood-ball handles on each side, angled slightly upward to account for your grip as you move it down a board. The plunge base has soft-grip handles so when you put pressure on it as you move it down, it won’t hurt your hands. 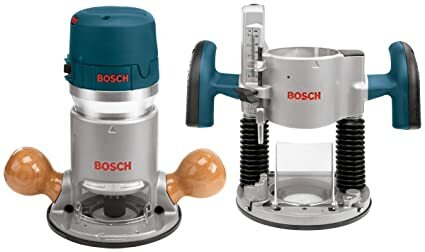 Bosch also hit a homerun with this model due to its size. On all counts, it’s built for easy performance. The dimensions for the machine are 19 ½-inches by 14 ½-inches by 6-inches for fixed-base and 6 4/5-inches for the plunge-base. It weighs just 19 ½-pounds. With these specs, it should be easy, or at least manageable for anyone to use this router over and over again for projects. Even if you have a high-usage for this machine on one project, your hands should be fine. This Bosch model is also built to last. We love the extra-durable features it has. All bases and the housing for the motor are made from aluminum. The power switch is also sealed to avoid dust. These both help to make it a much longer-lasting machine that will serve you for years to come. It also has a carrying case that can store everything for convenient transport. When you open your Bosch 1617EVSPK you’ll see the motor, the fixed base, the plunge base, the plunge-base chip shield, the fixed-base chip shield, ¼-inch and ½-inch collet chucks that are self-releasing, a T-handle hex-height wrench for adjustments, a carrying case and a forged bit change wrenches at 16mm and 24mm. Overall this was our favorite machine because of all its great features: power, comfort and design came in at number one. We happily made this our gold pick and we’re confident you’ll love it too. Next we chose our silver pick. This time the spot was earned by the Dewalt DWP611PK 1.25HP Max Torque Variable Speed Compact Router Combo Kit. This was a stand-out because of its light-design, power and ease-of-use. Here are details on what we found during working with it. Like our gold pick, this Dewalt is also a powerful little machine. It has a 1.25hp motor and 7amps of power. The speed is 16,000RPM to 27,000RPM. We loved that this machine gives so much power because if you have a heavy workload and need a router that can work a lot, this will definitely do the trick. It has a variable speed that you easily can control and switch between. The motor also features a soft-start that helps to maintain motor speed for a reliable and consistent cut every time. Consistent RPMs mean that your work will be that much cleaner and give you an ending better result. This Dewalt also had a lot of great design features to it. If you are using the fixed configuration, you can easily just hold the silver metal base of the machine and push it along the edge of your piece of wood. It will clean away the edge smoothly. We were a little concerned that there wasn’t a handle, but after using it without one a few times, we got used to it. It actually makes the machine easier to work with. If you are using the plunge configuration, it does have handles. Using it this way provides you with two soft-grip handles on each side. These were very helpful and made it easy to use repeatedly. 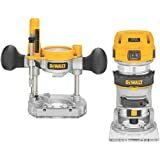 The Dewalt also has a D-shaped base that maximizes stability and keeps your router flat as you move down the edges of your machine. There also is an easy-grip spindle lock to securely hold the bit. It also is very easy to exchange bits for the appropriate sizes to finish your job. The plunge-base is clear, and that makes it extra simple when you want to target your bit. It also has a simple release locking-lever. When you are switching from the fixed- to the plunging-base, you can do it easily with one step. The switch to lock the motor to the chosen base is large, so you won’t have to fumble for it if you’re working diligently to finish the project at hand. Dewalt also went to some trouble creating an easy-to-use machine with this model. We particularly liked the fixed base’s LEDs on each side. This makes visibility that much easier when you are working with it. It ensures that you will always have a clear shot of how your router is moving. There also is a ¼-inch collet that helps the bit remain in contact while in the shaft. Holding the bit tightly allows for more control and a cleaner cut. Many of the models we reviewed plagued us with bits that lost their secure place after multiple uses. We quickly vetoed these models, but the Dewalt never got there. The bit was as secure post-completion of the job as it was when we first began. The weight of the Dewalt DWP611PK is just 8-pounds. With the plunge-base it is 19 ¼-inches by 7-inches by 10 ¼-inches. With the fixed-base it is 7.3-inches by 5.6-inches by 11 ½-inches. Regardless of which one you are using, you will find that it is lightweight and easy to direct. The motor works well with the weight to cut as you push it with a small amount of human effort. You can adjust the fixed base to increments of 1/64-inches, which is a fantastically precise amount of space. The Dewalt comes with the motor, the fixed base, the plunge-base and a wrench. Overall, we liked this router a lot. It was functional, handy and light-weight for extended use. This is another machine that may serve you well if you’re looking for a router to complete your next job. 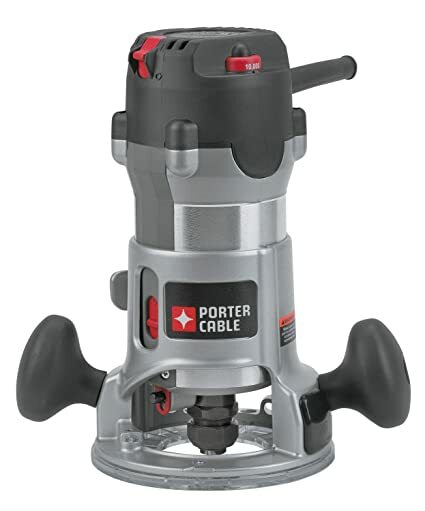 Our bronze choice is the Porter-Cable 892 2 ¼-Horsepower Router. This is a fixed-base router. It has a plunge-option available and sold separately. We liked this machine because it’s simple and straightforward, yet powerful and useful. This is another powerful machine. This one works at 12amps and speeds from 10,000RPM to 23,000RPM. This machine also has the variable speeds our other top picks did, and that is a great feature to include with machinery. It allows you to control the power-at-hand based on what you need to most efficiently do the specific job you are working on. This also has the soft-start motor, which helps to maintain a consistent speed and in turn, a clean result. If you are using your router on the edges of a large project, you’ll get the same result when you begin, as when you finish. For consistency, this is a great tool. It offers the chance at a precise job from beginning to end, which every woodworker needs. We also liked the controls on the Porter-Cable. They are bright red on the dark gray machine. They are simple and straightforward. There is a red on/off switch and a red dial for adjustments. In fact, all adjustments on the machine are in red, so you know exactly where to go to make any necessary changes. You can also make said adjustments from over the table you clamp it on. This is another convenience feature – having all controls located at the top. You can remove the motor and adjust the height of your bit and lock the spindle in place. All you need is a 3/16-inch hex socket (not included.) These adjustments can be made with one hand and quickly. We loved this feature because it requires minimum time for changing bits and maximizes the amount of time you are working to finish your job. That’s always a good thing! The Porter-Cable also is built for comfort. The manufacturer really made a point to focus on this aspect of their 892 model. At the bottom of the fixed-base are two soft-grip “over-molded-grip” handles, as manufacturers call them. This just means that the grips are large and softer to hold. These are particularly easy on your hands as you work. We give all of our products extra points when the manufacturers take end-users’ comfort in mind. Things like easy-grip handles always rate high with us. We want to ensure that our readers are given the easiest-to-use products that still give them great results in the end. The Porter-Cable definitely fits the bill. It also is light weight at just 12.7-pounds. Its dimensions are 12.1-inches by 7.4-inches by 11.5-inches. We liked the dimensions a lot because they play to the built-in ease-of-use. We tested this router a lot—using it for extended periods of time anticipating our readers who needed it for a bigger job. Regardless of how much we used it, it was never cumbersome or difficult to work with. It got a lot of points for comfort. When it comes to inclusions, you get the motor, the fixed-base, both ½-inch and ¼-inch collets, a collet wrench and the carrying case. This is a great tool to start off with if you’re new to the router-world. It has the functionality you need, without all the extras that likely you don’t need just yet. Plus, it’s easier than any of our machines to work with because of the lack of extras. That’s not to say it isn’t effective – we don’t promote products that aren’t high-performance. It’s just lacking the multiple changes that may slow your job if you don’t need adjustments. The Porter-Cable is a great little starter-machine. As a router it gets the job done easily and efficiently. After our assessment, we liked it enough to give it our third-place pick. We are also confident you will like it too. As usual, when we rate products we always save one spot for an honorable mention, or as we like to call it, our budget buy. 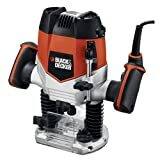 For this list our budget buy goes to the Black & Decker RP250 10-Amp 2 ¼-inch Variable Speed Plunge Router. At 2hp, this Black & Decker model router is another powerful little machine. This one has a 10amp motor that can provide 8,000RPM to 27,000RPM. We were happy to see the variable speed on this machine too- just like on our other picks. Variable speed again means that you can use the amount of power needed to finish the job. It also means you can adjust for different species of wood—hardwood doesn’t stand a chance. You can still easily work with it. When it comes to the design, it is also easy to use. We were happily surprised that a budget pick at this cost would be built with the plunge-option. Because it is a plunge-router, you don’t have to worry about switching from a fixed-base to a plunge-base. It can be used as-is for all router uses. By building it into the machine, this makes it more useful to the end-user. Whether you need a fixed-base or a plunge-base you can easily tackle the job. With this one, you can work on a piece of wood trim or start from the middle of a board for an inside-the-center router job. The comfort of this model Black & Decker is also great. It has soft-grip handles on each side. You can press down lightly to move the machine along the edge of your boards and get the edge required. It works well with creating inlays and cut-outs. One thing that impressed us was this machine’s ability to do intricate work, despite its lower cost and minimal features. It still is able to get just about any job done—like its much higher-cost counterparts. It also is built with visual ease of use in mind. The manufacturer made it a point to include sightline design. This makes it easy to see what you are doing when you’re using the router. This is always helpful and the enhancement of visibility earned it more quality points. At just 10.9-pounds this is an easy-to-move router. Its dimensions are 11.9-inches by 11.5-inches by 6.6-inches. It is small enough to be easily portable but large enough to get just about any job done. You can thank the power built in for that! We can see users working with this router to complete small tasks and large jobs. We loved its versatility and overall use. Changing the bit is easy also on this machine. It has a spindle lock that is quick to use and you can easily switch bits out for different desired results. All of the adjustments are manual—either done with a lever or a dial. Though they aren’t fancy with LED lights or digital read-back, they don’t stand in the way of this router’s efficiency. That was great news for us and was one of the main reasons why we gave it the budget buy nod. Included in the package for this Black & Decker is the router, a wrench, a parallel edge guide and a ¼-inch collet. The edge guide is particularly helpful for new users. If you haven’t used a router before, or haven’t used one much, this guide can be a very helpful tool. It lets you move the router alongside a straightedge for a precise cut. The base of this router is also larger than some other models. Again- this is a feature that new users may enjoy because of its steadying of the machine as it moves. Overall, the Black & Decker RP250 is a great little tool. The only adjustments you’ll need to become adept at is the bit change. However, it’s so easy that after changing it out once, you’ll easily get the hang of it. If you want a standard router with the ability to get multiple jobs done, with as little adjustments as possible, this could be the perfect choice for you. When working with routers, we had a few things in mind: power, comfort, adjustment ease and the complete package. We searched through a lot of them and tested a lot of them to come up with the best ones in the market. To make our assessments, we tested each one for the above criteria. Were they powerful enough to handle any job? Were they easy to use for extended periods of time? Were they easy to adjust? Did they have everything a user would need included in the package? We answered all of these questions for our list of products. We wanted to make sure that each one was the perfect all-around machine. Here are the details on what we were looking for when we did our assessments. With any power tool our primary concern was the motor. Would it be able to stand up to long-term use and produce excellent results no matter what? We used the test products on hundreds of dummy projects. We wanted to make sure that the motors—at their varying speeds—performed well and powered the machines the way manufacturers stated they would. We also looked at how easy it was to switch from one speed to another. We also looked at the RPM each machine worked with. Remember, the higher the RPM, the cleaner the cuts. We wanted all of our routers to produce professional-looking results even if they were not going to be used professionally. Whether they were on the jobsite for some high-end million-dollar house project, or in the workshop to finish up a small table’s edges, we wanted the same perfect and precise result. Next, we looked at the overall design of each router on our list. We wanted to make sure that it was primarily functional, and secondarily good-looking. Function was key because how a product performs based on its design is the most important thing that brings it value. On top of that though, we also wanted the machines to look good and look like their construction made sense. We also wanted the look to be professional, sleek and sturdy. All of our chosen machines were high-quality. They could be used for at-home jobs and for professional jobs. They all were sleek too. Their builds were nicely packaged together. If they had interchangeable parts, and different configurations, we looked at each option. We assessed whether or not they seemed to fit together well. We also looked for sturdiness. As with any power tool, sturdy is a good thing. We anticipate all of our promoted products to get a lot of use. Even if they don’t, we want them to be built like they are going to be used over and over. That durability we want is another aspect of bringing our readers the greatest value possible for their tool buy. We also looked at the comfort of using the routers we were assessing. Sure some users may just need a router for a small job that isn’t taxing. However, we also know that other users are going to be working with a router for hours and hours, possibly days and days. It’s these users we had in mind when evaluating the comfort. We looked at things like what the handles were made of. We also looked at positioning of handles. We took note of the adjustable features like depth of the bit, and changing the base, to make sure that all changes could be done comfortably and easily. We paid special attention to the make-up of the handles. Some lesser-performing models had hard plastic handles that over time, could cause users some pain and discomfort. Those were quickly pulled from consideration. We wanted the models with easy-grip handles that would take long-term use and still be comfortable to use. Finally, we looked at any extras that were included with our machines. If they had an extra wrench or parallel edge guide or a unique spindle lock, we took note. We wanted to herald the manufacturers who had our users in mind and were willing to include everything they could to make projects easier to handle. We always love these manufacturers and give them extra props if they are able to help get the job done quicker and more efficiently. So our list for the best wood routers is complete. We believe that any one of these machines could easily get your project completed efficiently. We did our testing and re-testing to come up with a thorough evaluation of the routers out there. Test any one of these out and we’re sure you’ll be happy with the end results.